Rarotonga is well known for its lush tropical surroundings, great beaches, and pristine lagoons that are all surrounded by the beauty of the Pacific ocean. This tour gives you a more in-depth experience of our natural surroundings from the comfort of an air-conditioned car or van, and with your very own experienced local tour guide. Over 3 hours you will visit a number of sites including Te Ara Museum—a newly established interactive museum located in the heart of Muri and solely based on the Cook Islands history and marine life. Here you will have the opportunity to see ancient Vaka migration routes, fish aquariums as well as read and learn about our lagoon and coral that is home to many tropical fishes. You will visit Black Rock, a volcanic boulder on the edge of the lagoon, traditionally believed to be the departure point of spirits to Avaiki (the af-terlife). 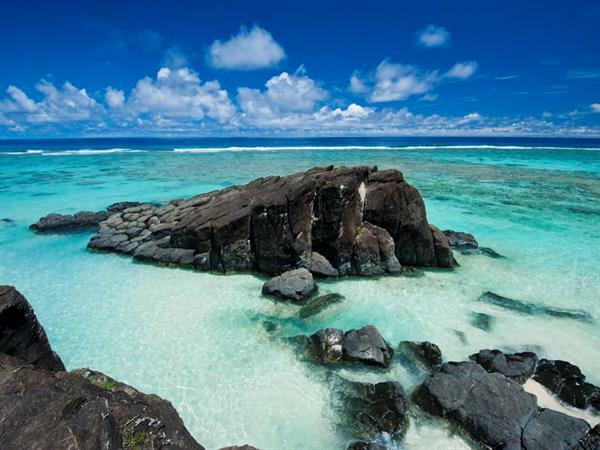 You will also be shown to many of the best snorkelling spots around Raro-tonga and the rich plantations of citrus fruits, bananas, tapioca, papaya, taro and many other crops our local people grow to feed their families. Another stop is at the Maire Nui Tropical Gardens which consists of seven acres of absolutely spectacular botanical nature with lush lily ponds, and a magnificent mountain view. The garden here is a wonderful place and displays a variety of beautiful plants and flowers, including hibiscus, heli-conias, frangipanis and bird of paradises’. Then to complete your tour, you will enjoy a delicious lunch at the Mooring Fish Cafe.